The financial effect of flooding can be devastating, but often it is the subsequent upheaval that causes the biggest worry. The Association of British Insurers (ABI) says that the average cost of flood damage to homes is between £20,000 and £40,000. But after severe flooding it can take up to 12 months for a property to dry out completely. The level of insurance claims from the latest floods that have hit Cumbria, west Wales and Dumfries and Galloway could exceed £100m, but there are some basic rules that people affected should follow. What should I do if my home or business is flooded? Clearly the most important thing to do is ensure you are safe - belongings can usually be replaced, people cannot. Then contact your building and contents insurer as soon as possible. Most have 24-hour helplines. They would expect you to take reasonable steps to protect your property. If your property is at risk, then take easily moveable objects upstairs, and use sandbags to hold back the water where possible. If the property has already been affected, you may need to arrange for temporary repairs to stop any damage getting worse, in which case you should keep receipts for insurance claims. The ABI says most insurance policies will cover the cost of alternative accommodation if people need to move out of their homes while they are repaired. Comprehensive motor insurance usually covers flood damage to cars, but third party cover generally does not. What happens in the aftermath? Once the flood waters have started to recede you can take up carpets, but you must retain them so that the insurance company loss adjuster can see them and verify the claim. All other damaged items should also be retained rather than thrown away. If the weather permits, open all windows during the day because the air outside the house will be less moist then inside. By mid-afternoon, close the windows and put the heating back on if it is safe to do so. Some items, such as photographs and paperwork, should be dried slowly, even though the instinct is to do so speedily. Various fixtures and fittings should be dealt with in different ways, and your insurance company can advise you about this. "Events like flooding highlight why insurance is so important," says Nick Starling, the ABI's director of general insurance and health. "The first priority for insurers will be to ensure that every claim is dealt with as quickly as possible and they will do everything they can to help customers recover." I live in a flood plain - will I still be able to get insurance? 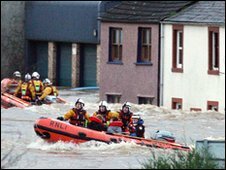 Under a deal struck between the government and the insurance industry in 2005, insurers agreed to continue to insure homes at risk of flood. However, you may find it hard to switch insurance provider. The cost of the cover will also reflect the risk, so expect it to be more expensive than in an area relatively free of flood threats. As part of the agreement the government said it would increase its spending on flood defences. For businesses, there is free advice available from bodies such as Business Link in England. The Federation of Small Businesses is offering interest-free loans of up to £5,000 to help small firms across the UK cover costs associated with keeping their business trading and with repair of their premises after flooding. What is the long-term picture? 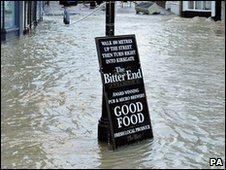 The 2007 floods across large parts of Yorkshire, the Midlands and the West of England cost insurers just over £3bn. They were on a much wider scale than the latest incident, but the insurance industry is gearing up for more and more claims in the future. Earlier this month the ABI said the cost of flood and windstorm damage would rise for insurers as global temperatures increased. This would lead to higher premiums for consumers and a restriction of cover as insurers would need more reserves. Based on a 4C rise, the average annual insured losses from river flooding and flash floods in the UK could rise by 14% to £633m by 2060. Windstorm losses could rise by 25% to £827m each year. However, in the south-west of England, flood damage losses could increase by 29%.